So, where is this allegory we keep talking about? Is it the characters? The actions? The philosophy? You are now more than halfway through Orwell's Animal Farm and have learned a lot about Russian History. Many of you are already seeing the similarities between certain characters in the book and historical figures. For example. Napoleon is clearly an allegorical representation of Joseph Stalin, but why? How? And what about the other characters? In this module you will explore connections between the characters in Animal Farm and characters from Russian History. 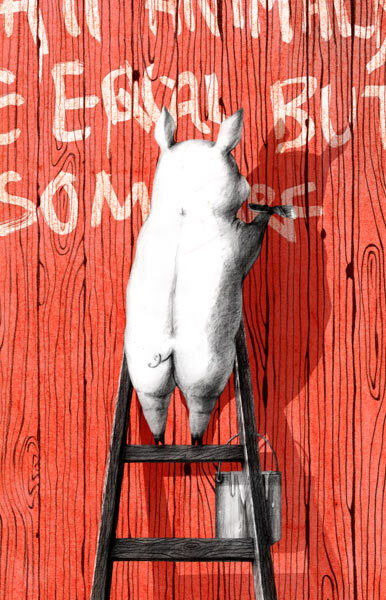 If you are having difficulty understanding or identifying the key events and characters of Animal Farm, read this synopsis on Spark Notes. Head to the Module 4 Discussion page and post about the similarities between characters in Animal Farm and the Russian history you have been reading. Head to the Understanding the Allegory Assignment page, make a copy of the Google Doc found there, and fill in the table. When you are finished, share your document with the completed table with the instructor. Set share settings to "Can edit" or "Can comment". When you finish all of the tasks above, review your work to make sure it is the best you can do, make sure all work has been submitted to the correct place, and then click the button below to advance to Module 5.